BOOK YOUR CHARTER ONLINE TODAY TO SECURE YOUR SPOT! Inshore– fishing inshore this week we can expect plenty of sheepshead, snapper, snook, pompano, & the occasional tripletail. Shrimp on the bottom will be your best bet for steady action. Nearshore– Spanish mackerel will continue to be the main focus. Pecks lake reef will yield the best action. Find the boats, find the fish. Nearshore reefs & wrecks slightly further off the beach will be good for bottom fish like snappers & porgies using chicken rigs. Keep a Cobia jig ready for a Cobia. Offshore– Fishing this week we can expect a good push of mahi, sails, black fin tuna with this north wind & colder weather. Trolling ballyhoo with mullet dredges will cover more ground and give you better shots at more fish over a larger area. Drop a planer down 30’ with wire for steady kingfish action this month. Bottom fishing remains steady with plenty of snapper, grouper, ajs on the 8 mile reef system. 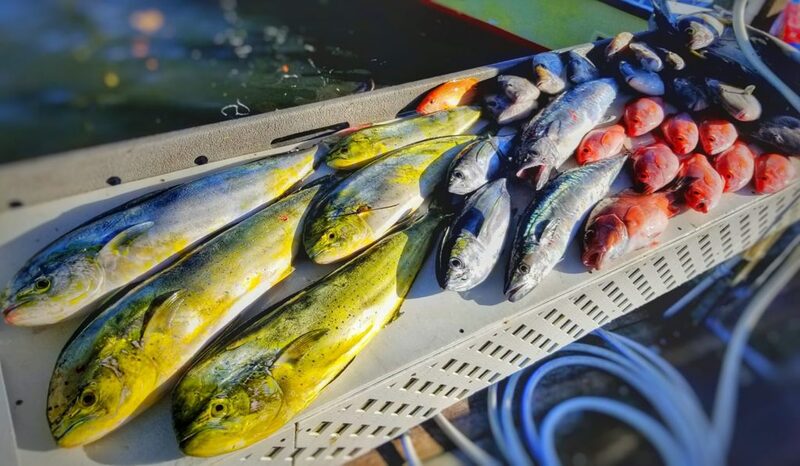 © 2019 Chaos Fishing Charters. All rights reserved.